What business goals must the product satisfy? What is the product’s revenue model? What is the timeline for the product’s release? What are the time and budgetary constraints for the overall product development effort and, in particular, for your design effort? What is the product’s essential functionality? What features must it include to compete in the marketplace? What other possible features might the product include? What are their priorities? What differentiates the product from other similar products in the marketplace? For an existing product, what features have customers requested? What information does your organization want to communicate to users? What information does your organization want to obtain from users? What technologies must the product employ? With what other products must it be compatible? What standards of performance must the product achieve? If the product is a software product, for what platforms is the product to be developed? Is the product a standalone product or part of a product suite? What user assistance or documentation does the product require? What training and technical support will the product require? For what international markets is the product to be developed? What capabilities and features must your product provide to satisfy your target users? What must your target users be able to do using your product? What workflows and tasks must your product support for your target users to be able to accomplish their goals efficiently? What needs, desires, and preferences must your product satisfy for your target users? What qualities must your product have? What information needs do your target users have? When do they need information? How should your product provide the information they need, when they need it? What data must your product enable your target users to provide or create and save? What kinds of data objects should your product let your target users manipulate? Are there different user roles your product must accommodate? Do your target users require your product to be customizable and/or personalizable? What standard of usability must your product achieve? For an existing product, what pain points does your product redesign need to address? Lots has been changed on the BBC News site. I wonder about stuff that hasn’t been touched. 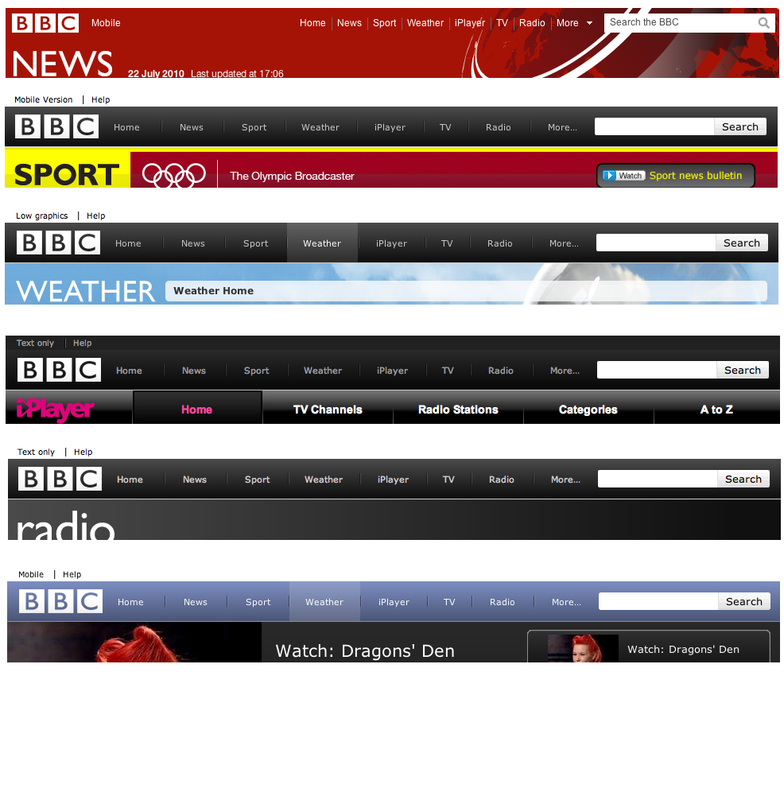 Despite its recent major revamp, BBC news has a visually inconsistent global nav and site search. Even the logo is smaller than on all other sites of the family. Any design rationale? good sense not to adopt the proposal.) For several years these screen designs were handouts in the one-day course in my discussion of interface design, and were then published in my book Visual Explanations (1997). Customized by the end user. Consumers will not only control what they get online, they’ll control the form that they get it in to a much greater degree than they do today. Aggregated at the point of use. Content, function and data will be pulled from different sources and combined at a common destination to create a unique experience. Social as a rule, not an exception. Social content will be integrated into most online experiences, not segregated into today’s blogs, micro-blogs and wikis. From M. Dorsey: What’s next for the online experience? Mother BBC has launched its redesigned News site a few days ago. I want to actually use the site on a day-to-day basis before I express my user opinion. So no comment yet. I’m however interested in ‘The-making-of’. Paul Sissons, the creative director of this project, explains. His view on the site’s redesign appears rather presumptuous to me. It sounds a biit like ‘You may not realise or not even appreciate it, but rest assured: we spent your money doing the right thing’. And indeed, there are some interesting design considerations, like the new homepage template that allows controlling the ‘volume’ of a topic or story. In other instances, the BBC appears to adapt standards that other news sites already have put into practice a while ago, such as horizontal top navigation, bold typo, and vertical depth (prime example for this site style is the Swedish newspaper Dagens Nyheter).